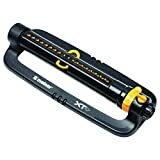 Melnor XT Turbo Oscillating Sprinkler with One Touch Width Control & Flow Control, waters up to 4,000 sq.ft. Are you still struggling to keep the water on the yard and off the drive? Then the XT4200 has the precision you need. This sprinkler adds another dimension of adjustability with an integrated flow control dial for precision water adjustments. Need to water a large area? You can do it with this sprinkler with its large 4,000 square feet of coverage which is up to 75′ long x 53′ wide almost the size of a basketball court! You can use the range control to reduce the coverage from the maximum 75′ length down to only 15′ long by sliding the range control levers. You can also position the pattern left, right or center using the range control levers. Not everyone has a yard this large though, so this sprinkler has the ability to adjust both the length as well as the width of its watering pattern. The width adjustment is a Melnor exclusive with the patented One-Touch system which allows you to adjust the width from its maximum of 53′ to a minimum of 20′ by simply moving a lever up or down. Have the overall pattern right, but just need a little more, or a little less coverage? Then use the integrated flow control knob that acts like a zoom to grow or shrink the whole pattern. So whether your yard is large, small, or somewhere in the middle, this sprinkler has you covered! Melnor’s large diameter base tubes automatically stabilize by adding nearly 1 pound of weight to the sprinkler when it fills with water while in use, weight that then empties out after you are finished watering. The large diameter water tube also helps the water to spray farther and in a more even pattern from the 18 precision nozzles by providing even pressure and a smooth even flow with reduced water turbulence. Finally, the heart of this oscillating sprinkler that gives it a limited lifetime warranty is the amazing Infinity Turbo Motor. The Infinity Turbo is a precision motor that provides smooth operation at both low and high pressure, and enough torque to power through any dirt or debris that may be in your water hose. The magic is in the transmission gearing that steps down 7 times to deliver high torque with very low loss of power. Who would have believed so much thought was put into a sprinkler? That’s simply what we do at Melnor to make tough jobs just a little bit easier for you. Engineered with pride in Virginia’s Shenandoah Valley, Melnor is your trusted brand for the Great American Lawn.With a two-stage, long-life turbo-drive motor, Melnor’s turbo oscillator has adjustable coverage that can vary from 874 to 3,900 square feet (maximum coverage is 58 by 68 feet). Adjusting the range or width is wonderfully easy–simply slide the yellow controls to manage your coverage. With flow control for fine adjustment, the sprinkler has 18 rubber reverse-trumpet nozzles, six of which have positive shutoff. Limited warranty.